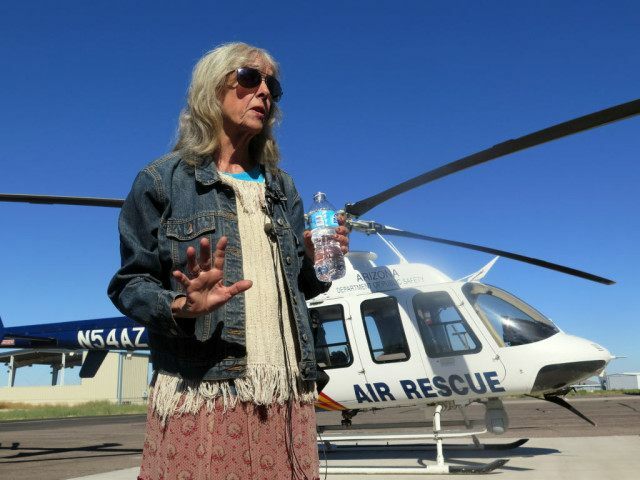 TUCSON, Ariz. (AP) — Ann Rodgers ate plants and a turtle and made a “help” sign large enough that a helicopter was able to find her after nine days in the Arizona wilderness. “We kept trekking as long as I could go each day but as soon as that sun started to drop below those high walls, I had to stop, get my campsite ready, make my campfire, bring in my wood to keep it going all night,” she said during a news conference Wednesday. But an expert says she broke the most important rule for being found: Stay with your car. Rodgers’ car was found days before her rescue, while she walked through the forest. She also hadn’t told her family she was headed to visit them and was never reported missing. Cody Lundin, a survival instructor in Arizona who co-hosted Discovery Channel’s “Dual Survival” series, says one of the first rules those courses teach is to never leave a car because it’s more visible than a person. Another is to let people know where you’re headed and when. “Clearly she did whatever she had to do to stay alive. But she didn’t need to do what she did. This ordeal didn’t need to last for nine days,” Lundin said. Her hybrid car ran out of gas and electric power and she didn’t have a signal for her cellphone. Rodgers kept looking for a sign of people, surviving off plants and pond water. She says she knew which plants were edible because she’s lived in and studied the desert for a long time. White Mountain Apache Forest rangers spotted her car on April 3 and ran a check on the license plate. They called the Gila County Sheriff’s Office, which began the search. Sheriff’s Detective Johnny Holmes said Rodgers was difficult to track. He said the sheriff’s office used a K-9 unit and obtained her cellphone information to no avail. “We couldn’t find anything of where this lady was,” he said. “I was frustrated, but I knew there were people who cared enough to make sure somebody found me sometime out there,” Rodgers said. On April 9, the sheriff’s office gave GPS coordinates to the Department of Public Safety and asked the agency to fly over the area. The DPS helicopter pilot spotted a large “help” sign made of sticks and rocks.